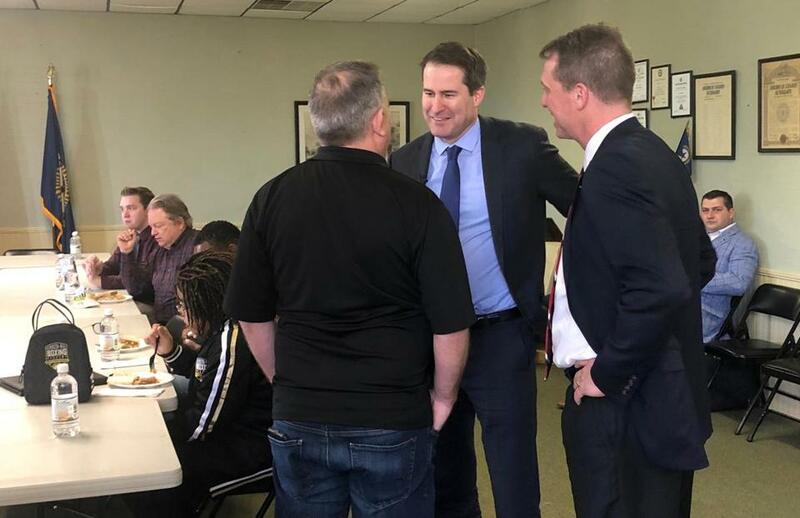 Representative Seth Moulton (center) spoke to a veteran at a roundtable in Columbia, S.C.
COLUMBIA, S.C. — At a time when even long-shot presidential candidates like spiritual guru Marianne Williamson and Andrew Yang attract crowds of hundreds, Representative Seth Moulton came face to face with cold reality this week on a trip to South Carolina. There, at the student union of the University of South Carolina, a group of 22 students sat politely Tuesday to hear a pitch from the Salem Democrat, who is openly mulling his own bid for the White House. After rearranging the chairs into a circle, Moulton ran through issues like the latest college admission scandal and the death penalty, filling in silences with attempts to engage the students. “I’ve used weed. I am not in prison, so I think it is pretty screwed up that a lot of people are,” said Moulton, 40, in response to a question about marijuana legalization. He said he tried it before it was legal for recreational use in Massachusetts, finally prompting a few chuckles in the crowd. For years it seemed like Moulton had nothing but buzz: The former Marine Corps officer upset a nine-term congressman in a 2014 primary, and seized upon the unrest in the Democratic Party to build a roster of veteran candidates and a lucrative fund-raising network — all while cultivating a national image as an outsider known for his foreign policy chops and military experience. Then, last fall, he unsuccessfully sought to topple Nancy Pelosi as the leader of House Democrats, weeks after the party won the majority, and in the process angered many women — including some in his district — who denounced his efforts to oust the first woman to hold the speaker’s gavel. Now, further on the outskirts of power on Capitol Hill than ever, Moulton has suggested he’s interested in a White House bid, kicking off a tour of the first states on the presidential nominating calendar. One early review: “Moulton may have a bright future. I am not sure if now is the moment,” said Sean Carrigan, a former congressional candidate who attended a roundtable discussion for veterans Moulton held at the American Legion. Moulton said he hasn’t made a decision about running for president yet but said he’s “taking a serious look” with recent visits to New Hampshire and South Carolina, as well as planned trips to Iowa and Nevada. But those close to Moulton say he is preparing to enter the contest next month, when he believes donors and activists will be open to taking a “second look” at the field. He repeatedly told voters in South Carolina that he believes Democrats must nominate someone who can beat President Trump and heal the country’s partisan divisions. Implied in his argument: He believes he’s the guy who can do both. Meanwhile, the 2020 campaign season is well underway. Kamala Harris is drawing crowds of thousands. Elizabeth Warren announces in-depth policy initiatives every week. Beto O’Rourke hops on coffee shop tables to address throngs of listeners. Even lesser known candidates, such as South Bend Mayor Pete Buttigieg, boast they’ve attracted enough small donors to secure a spot on the debate stage this summer. On the American Airlines flight from Washington to South Carolina on Tuesday, Moulton sat next to former Virginia governor Terry McAuliffe, another potential presidential candidate, who shared his South Carolina briefing book with the congressman. The heavy military presence in South Carolina would seem to provide Moulton with a friendly launching spot. Upon arriving in the state, Moulton appeared at ease Tuesday during a veterans roundtable. His topics ranged from the shifting economy to the changing nature of warfare, and his path from the Marine Corps to elected office. “The first congressman my parents met?” said Moulton, before pausing for the punch line: “Me, their son.” The audience didn’t react. Ahead of Moulton’s Tuesday evening stop at the University of South Carolina, the group of College Democrats were strategizing about how to recruit more dues-paying members to the club when O’Rourke is scheduled to visit the school. Organizers were expecting O’Rourke to draw as many as 1,000 people. “Look, Moulton is impressive, but I don’t think anyone is going to pay $10 club dues to meet him at a private reception like with Beto,” said Hart Johnson, a senior at the university. Moulton said that the national level of interest in O’Rourke or Harris, or even Buttigieg, doesn’t bother him because he isn’t a candidate himself. Moulton often brings up subjects not discussed by his potential competitors, such as national service, national security, and foreign policy (voters did not ask about his challenge to Pelosi). He proposes the government should expand AmeriCorps and the Peace Corps so that, while voluntary, some type of national service becomes the norm. The Democratic presidential race has so far been dominated by domestic concerns such as health care, the economy, race, and even eliminating the Electoral College (which Moulton came out in support of last week). At both of Moulton’s stops in South Carolina, voters asked about whether he supports Universal Basic Income, an idea championed by presidential candidate Yang that proposes Americans should receive a monthly paycheck to offset job losses due to the future automation economy. Moulton called it an “interesting idea” but said he opposed it. Still, he seized the opportunity to spark discussion among the students: “Tell me what you think. Are you a UBI guy?” he asked. Don Fowler, a former Democratic National Committee chairman and pooh-bah of South Carolina politics, met Moulton on Tuesday and said he was mildly impressed. But, he cautioned, if Moulton is serious about running, he needs to get into the race. If he runs for president, Moulton will also have to decide whether he will seek reelection at the same time, which is allowed under election rules. There are already rumblings about a primary challenge, and among those who have expressed interest is former state senator Barbara L’Italien. Moulton said he hasn’t “gotten there yet” on whether he’ll seek another term if he also runs for president. He says he has another decision to make first.